Midwest Rubber manufactures commercial, high grade and specification grade sheet rubber under the highest quality standards is honored to offer you our latest sheet catalog. We have expanded our catalog to include EPDM and Nitrile CI sheet, Vamac ®(ß, Epichlorohydrin and molded sheet 24" x 24" up to 3" thick. Calender thickness from .010" to .500". Depending on the thickness and hardness of the material we can maintain a tolerance of +/-.003". Standard widths of 36", 48" and 54" wide. 60" wide on certain polymers, as well as custom widths can be manufactured. Rolls of rubber can be slit from 1/2" wide and up. Special finishes include: high gloss Cellophane, paper finish and cloth fabric finish. PSA (Pressure Sensitive Adhesive) may be added to one side. Special polymers are available such as: fluorosilcone, silcone with a fiberglass insert, vamac, epichlorohydrin and more. If it is sheet rubber, Midwest Rubber can do it. With more than 100 compounds, same day shipping, and the ability to customize to your exact specifications, we are your one-stop source for rubber. We can help you find the perfect fit. 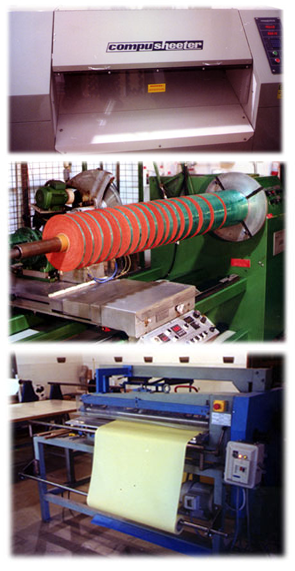 Sheeting - Our sheeter is designed specifically for long-run, high-volume cuts to 12 feet in length. It is used primarily for large run, “cut length” requirements. Slitting - In 1999, Midwest purchased a new precision slitter capable of converting material rolls up to 20 inches in diameter and weights to 400 pounds. Accurate cuts from 3/8 inch in width are now possible in thicknesses from .015 inch. These close tolerance cuts are ideal for prepping material for automatic die cutting presses. This slitter greatly improves our converting capabilities, thus allowing customers to order material in finished form without incurring multiple shipping charges. We also have a trim slitter for small roll applications. We will continue to strive to be your # 1 sheet rubber supplier. Thank you for allowing Midwest Rubber Sales to be your inventory warehouse for your immediate sheet rubber requirements and letting our custom manufacturing capabilities meet your special needs.